Do you wake up in the morning and find that your jaw feels tight? Perhaps you also suffer from recurrent morning headaches or sensitive teeth? If these symptoms sound familiar, then it could be that you are suffering from a very common disorder known as bruxism. While the impact of this condition can be unpleasant and can have a permanent effect on your teeth, the good news is that there are a range of things that you can do to prevent bruxism from occurring. Bruxism is the name given to the involuntary movements of teeth grinding and jaw clenching, which in most patients, happens primarily when they are asleep. However, some patients with bruxism may also find that they suffer from these habits while they are awake, particularly if they are triggered by the common causes of the condition. It is estimated that as many as 10% of adults and 15% of children suffer from bruxism that the present time. Why a patient might suffer from bruxism is not always obvious. It rarely occurs as a standalone condition and is almost always diagnosed in combination with one or more other sleep disorders including sleep apnea and insomnia. Bruxism has also been linked to periods of stress and anxiety with studies showing that approximately 70% of cases occur due to this reason. Even a patient with no history of bruxism may suddenly develop the habit if they go through a difficult period in their life. Many experts believe that this is because individuals with these vices are more likely to have hectic, demanding lifestyles and use these outlets as a way to help lower their stress levels. If you are unlucky enough to suffer from persistent bruxism, there are a range of treatment therapies that our dentist may recommend which will alleviate your symptoms before considerable damage is done to your teeth. 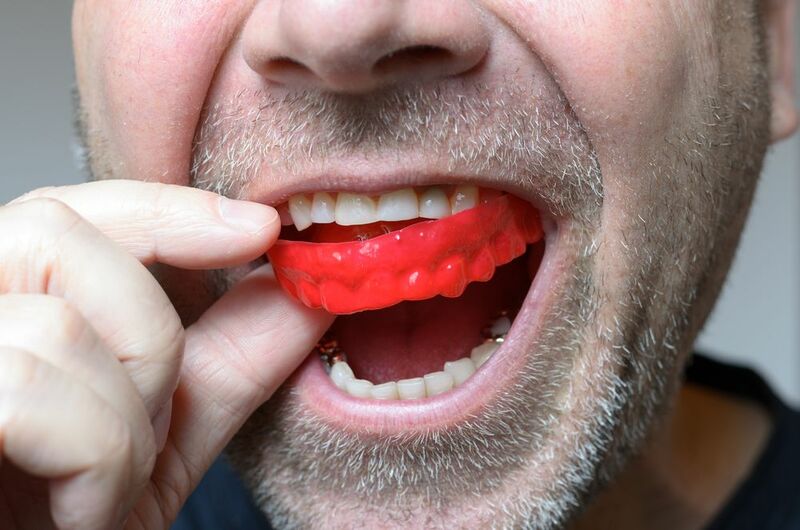 A mouth guard worn at night is largely considered to be the most effective form of treatment. Nevertheless, we firmly advocate that prevention is far better than cure. Fortunately, there are also some steps that you can take to minimize the likelihood that you will develop this common but unpleasant condition. Massaging the jaw muscles and consciously taking steps to relax your mouth and jaw during the day can help prevent grinding at night. There are also some jaw exercises that have been shown to be beneficial – ask our dentist to demonstrate these for you. Chewing gum may seem like a harmless habit, but in patients who are predisposed to bruxism, chewing anything, including gum, can put added stress on your teeth and jaw. If you think that you may be suffering from bruxism, or if you aren’t sure and would like a professional opinion, our team of experts are on hand to help. We can identify if you have this condition and if so, what you can do to control and manage your symptoms and dental health. We can also offer comprehensive preventative advice. Please do not hesitate to contact us with your enquiry, or to book an appointment.